This ECO term has been obsoleted. Do not annotate to it. comment: The children of 'biological assay evidence' have been moved under 'direct assay evidence', and this term has been deprecated with no children left. Pages in category "ECO:0000094 ! 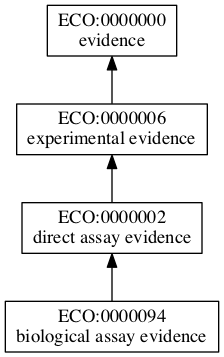 biological assay evidence"
This page was last edited on 8 April 2019, at 06:05.